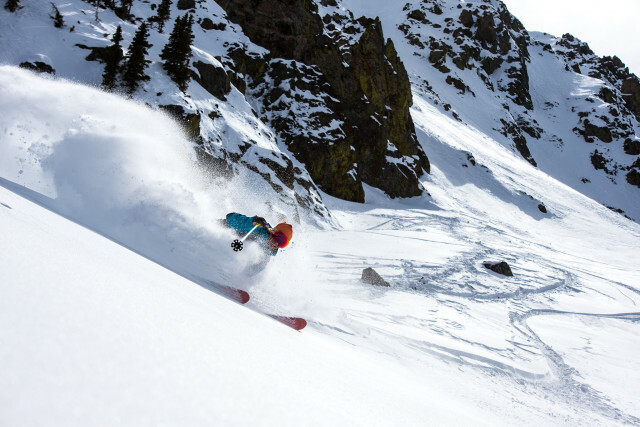 This story originally ran in POWDER’s December 2015 issue (44.4). All photos by Liam Doran. SOMEWHERE BETWEEN 220,000 AND 430,000 YEARS AGO, a large 16,000-foot stratovolcano outside present day Flagstaff, Arizona, either blew its top or imploded. The phenomenon left behind a caldera and several 12,000-foot mountains called the San Francisco Peaks. Glaciers then moved through, further chewing up the landscape. As all of these massive historical changes took place, one geological feature inside the crater held its ground. It was a ridge that was part of the volcano's internal plumbing—made of hardened magma—and strong enough not to collapse or be chewed away by the moving ice. Today, that feature is called Core Ridge and it juts out of the western edge of the crater and travels east. 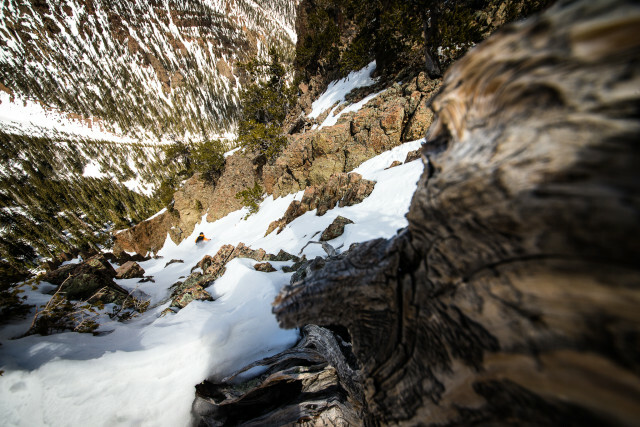 It falls off steeply on the north side, and the couloirs that have been chiseled into the volcanic rock are a favorite piece of terrain for a small crew of backcountry skiers who live in the Flagstaff area. Ken Lane finds the chute less skied on the backside of Arizona Snowbowl. Last March, I drove out from my home in Albuquerque, New Mexico, to ski Core Ridge with local Joshua Langdon and his regular ski partners JP Dudine, Jason Field, and Ken Lane. Langdon is a pre-med student who is regionally famous for filming his exploits in the backcountry. Dudine and Field are both dads who get out when they can, and Lane, 55, a bike shop owner, has been backcountry skiing in the area for 37 years. I arrived just after a rare storm came through and dumped around four feet of snow on northern Arizona—a good chunk of the region's annual snowfall average of 240 inches. After the storm, a giant slab—said to be nearly a mile long—broke loose and slid into the crater. Part of the slab also hit Core Ridge, which we accessed by riding up the Snowbowl Ski Area chairlift (the small resort sits outside the crater on the west side of the mountains). From the summit we skinned and hiked for 45 minutes up several hundred feet of elevation to the rim of the crater just below 12,000 feet. In the distance, we could see the North Rim of the Grand Canyon. 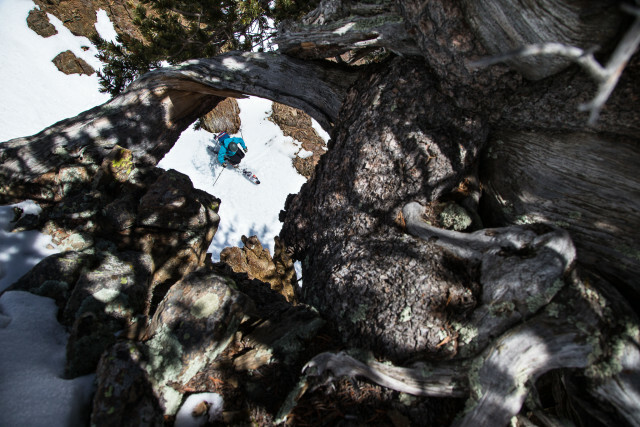 On the way down into the bowl we found soft corn snow through forests dotted with ancient bristle cone pines. Out in front of us we had a view of the red-hued Painted Desert on the Navajo Reservation, and up above us the Arizona sun was already beating down. Hiking over the ridge and skiing down into the bowl, I asked the guys why they stayed in Arizona instead of moving to another place with more snow. Conditions were great for us, but just a couple weeks earlier it had been bleak after yet another below-average winter. The old growth around Flagstaff is as twisted as some of the locals. Jason Field finds a way through. Langdon came to Flagstaff more than a decade ago after getting fed up with the scene in Jackson Hole. He was a sponsored skier, but couldn't stand the machismo and crowds, so he moved to Flagstaff and has been living a quiet ski bum life ever since. "I wanted to reconnect with what makes me happy in skiing," he says. "And I discovered that out here with ski touring." Lane is the unofficial mayor of the Flagstaff backcountry because he has such a long tenure. He stuck around because, like Langdon, he enjoys the mellow, unassuming vibe of the local mountains. He doesn't have to compete for first tracks, and when it does snow, he says the area can be world class. "If an El Niño weather pattern tracks through, the skiing down here can be just as good or better than anywhere north of us," says Lane. I found that out rather quickly as we hit a couple small but picturesque lines on the south side of Core Ridge while we worked our way east. Eventually, we stopped at a couloir off the north side the locals refer to as Powel's Prayer (named after a guy who accidently tumbled down the entire thing). We had a snack and as we stood around I peered down the opening. I couldn't see farther than 30 feet, thanks to a steep rollover. Lane said there was a tight choke about halfway down where the line pitches to 60 degrees. Conditions were safe and the shot was filled in thanks to that giant storm, but my stomach immediately turned to knots. This was not the kind of skiing I expected to find in the middle of the desert. 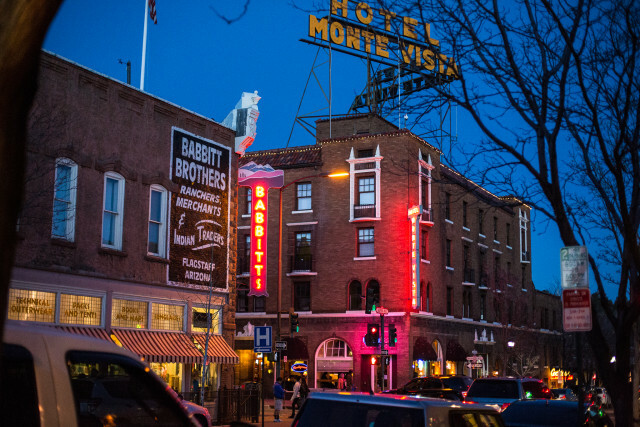 With its college-town vibe, Flagstaff is a unique ski town in the high desert. WITH ONLY FOUR SKI AREAS IN ARIZONA, eight in New Mexico, and a handful of backcountry spots in both states, the Southwest is not particularly known for its skiing. Some years, lower-elevation ski areas don't open for lack of snow. Last ski season, Colorado racked up 12.6 million skier visits, Utah had 3.9 million, while New Mexico and Arizona only had 1.2 million visits combined. This means it's a busy day in the Southwest backcountry if you see one other person. And aside from the weekend powder day at Taos, lift lines are non-existent. There's also the unique geography. Getting to a favorite backcountry spot in the Truchas Peaks, just north of Santa Fe, means driving through the high desert landscape of piñon-juniper dotted mesas and arroyos to the transition zone of stately Ponderosa pines. 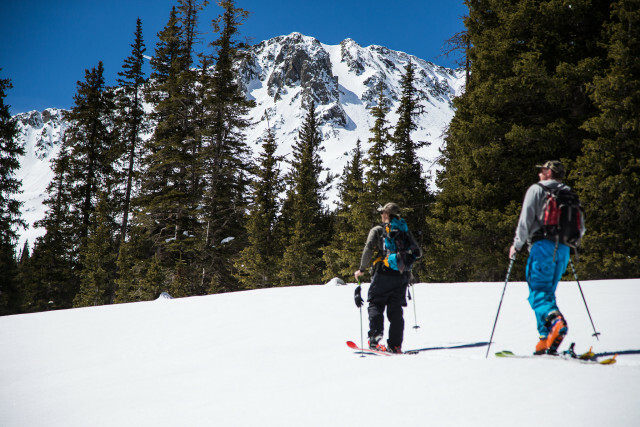 From the trailhead, the skin track weaves through conifer forests to the above-treeline peaks at 13,000 feet. On the way down, through thousands of feet of untouched powder, I have views of the vast Pajarito Plateau where the first atomic bomb was developed at the Los Alamos National Laboratory. A desert walk is a good way to beat the heat in New Mexico, with skiers Carlo Travarelli and Ben Wheeler. The ski resorts in New Mexico also reflect this diversity. At Angel Fire, which sits on the east side of the Sangre de Cristos, the mountain range that extends from southern Colorado to Santa Fe, there's a strange blend of New Mexico and Texas. The parking lot is full of giant trucks with Texas plates and gun racks, southern drawls echo through the lodge, and it's not uncommon to see cowboy hats and chaps on skiers noodling around this small resort (five lifts, 79 runs, and just over 2,000 feet of vertical drop). I learned to ski at Sipapu Ski Resort, located an hour or so southeast of Taos. It's a tiny place with just 1,000 feet of vertical. Like the best small hills, it's where families ski, the restaurant serves bad hamburgers, and lift tickets are less than $50. For years, there was only one triple and two small Poma lifts. Now, two triple chairs and two Pomas carry skiers from the bottom to the top, where the descent isn't any longer than 10 minutes. Sipapu is always the first place to open in New Mexico (usually in mid-November) because it makes a lot of snow. All the other hills around the area will be brown, but one run at Sipapu will have a coat of white. It's environmentally exhausting, particularly considering Sipapu's base elevation—at 8,200 feet —is quite low for this area. My parents, both political activists who live 30 minutes away, were members of a rural watershed coalition that fought the proposed expansion of the ski area that would have pumped even more water out of the Rio Pueblo for snowmaking. I agree with their stance, but I've shown up a time or two on opening day to satiate the jones after a long, hot New Mexico summer. 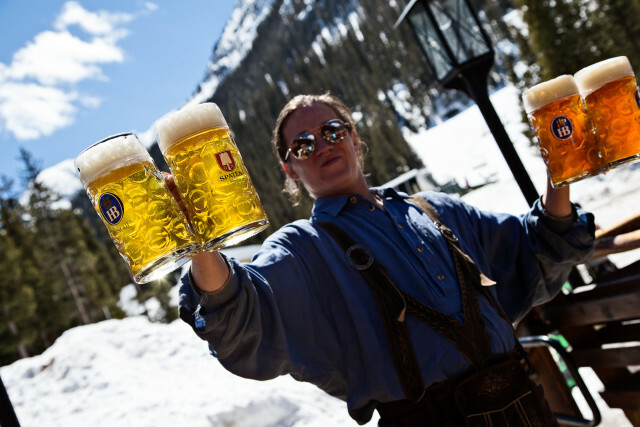 The Bavarian keeps it chill on backside of Taos, with its special Sandwich in a Glass. It might also be the only ski area in the country where white people can be the minority. Many of my ski buddies growing up were local Hispanos whose families have been in New Mexico since it was Mexico, or Native Americans who've been here even longer. English is still the main language spoken on the hill, but it's not uncommon to hear people talking about a powder day in our unique blend of Spanglish, or with an accentuated New Mexico voice, "�"rale, bro, that was awesome!" Taos Ski Valley is the Big Kahuna, of course, in size and reputation. Yet it also maintains its own custom and feel. "This place is authentic and the snobbery is non-existent," said Eliza Donahue, 18, who finished fourth overall in the 2015 IFSA North American Junior Freeride Series, and who I unsuccessfully tried to follow around Taos the week after the giant storm walloped the Southwest. Justin Bobb, a ski patroller who was with us, agreed. "There is a particular kind of low-key person who loves Taos for all its funk," he said. "Those are the people who move here, and stay here." Carlo Travarelli picks up on the local customs at Taos Ski Valley. BACK IN ARIZONA, on top of Powel's Prayer, I eventually decided to back out. All season I'd been skiing steep lines at Taos and across Colorado, Montana, and Utah. It was inching toward spring and I'd finally had enough. My partners were cool about it. Instead, we skied another line called Last Chance just a couple hundred yards farther west. That entrance was tricky and steep, too, but once you were committed, the chute opened up and you could see the entire way down the 600 or so feet of vertical drop. Threading turns through chalk I was relieved, but also ego bruised. I'd punked. At the bottom of the line, we re-applied our skins and started climbing back toward the rim of the crater to access the ski area. Following Langdon's track and constantly sipping water to stay hydrated under the hot sun, I thought about the irony of reaching my fear threshold in Arizona. I'd come out here pre-judging the place. I thought we'd be skiing lines that were good for Arizona, but boring compared to everywhere else. By the time we crested the rim and skied back to the lodge for beers, my shame had turned to good humor. I should have known better, and I laughed out loud as the sun set over the desert below us. Where to stay: The SnowMansion Hostel is cheap, communal, and 10 minutes from the ski hill.